Many physicians, pharmacists, students and their parents have a lot of questions in their mind about this curriculum. Here we have tried to get the maximum answers. The pharmacists can provide the clinical pharmacy services as shown in [Table 2]. Out of the services patient medication counseling is considered to be the most important part from a patient's point of view. The information that may be discussed while a counseling session purpose, expected action, storage, method of administration of drugs and medical devices. Overall skills required to provide better clinical pharmacy services are up-to-date knowledge of clinical aspects of drugs and good communication skills. After completion and during the course Pharm D candidate may provide the clinical pharmacy services in the hospital, , work in the areas Clinical research organizations (CRO), Pharmacovigilance, Pharmaco-economics, community services,  research and academics. As we know it is a newly launched curriculum in India, it will take time to get it well established. Pharm D candidates need to work hard and get recognized in the society for patient-care by clinical pharmacy services. They have to create a rapport with other healthcare providers such as physicians, nurses, and also with patients. Pharm D candidates have to generate the need of clinical pharmacy services in the society and prove its importance. As the Pharm D is mostly patient-centered curriculum, therefore, patients will be benefited the most. The patients would be able to know all the information about their disease, drugs and lifestyle modifications for the disease in future which would definitely increase prognosis of the patients. The clinical pharmacy services would also minimize the work-load of physicians from their busy schedule as well as it would decrease the load on the Indian health-care system. As a summary, it can be expected that the Pharmacists, i.e., Pharm D would play a major role in Indian health care system in future. This course will give an opportunity to pharmacists to work more prominently in Indian health care system. 1. Pharm.D. Regulations 2008. The Gazette of India, No.19, PART III, SECTION 4] Ministry of Health and Family Welfare (Pharmacy Council of India) New Delhi, 10 th May, 2008. pg. no. 1-97. Available from: http://pci.nic.in/PDF-Files/PharmD-Revised-A.pdf [Last cited on 2011 May 27]. 2. 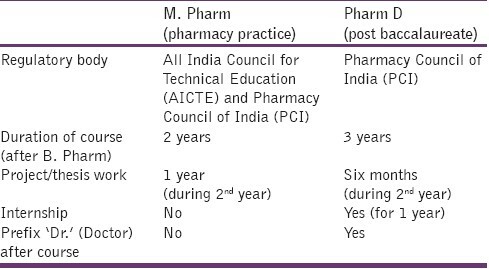 Frequently asked questions about Pharm D. Available from: http://pci.nic.in/PDF-Files/question.PDF [Last cited on 2011 Mar 13]. 3. Dooley M, Lyall H, Galbriath. SHPA standards of practice for clinical pharmacy. In: SHPA practice standards and definitions. 1996. p. 2-11. 5. Joyce AW, Sunderland VB, Burrows S, McManus A, Howat P, Maycock B. Community pharmacy's role in promoting healthy behaviours. Journal of Pharmacy Practice and Research. 2007;37:42-44. Available from: http://cbrcc.curtin.edu.au/reports_journal_articles/jppr%2037%2042-44.pdfth [Last cited on 2011 Jul 15]. Deshpande, P.R. and Sheriff, M. and Nazir, A. and Bommareddy, S. and Tumkur, A. and Naik, A.N.